The 2012 Oregon Big Game Regulations are on the stands at sporting goods stores all over the state. There are some new hunts, but what fires my imagination are the controlled 100 series muzzleloader seasons that recall the days of early Oregon. We read about the western migration and picture the wagon trains headed toward the sunset, but the mid-1800s reality was that there was almost as much travel east as there was west. In forts, in saloons and around campfires, there was a lot of conjecture about what the pilgrim should carry there and back. One of the authorities on the subject was Captain Randolph Barnes Marcy. In his book The Prairie Traveler he penned these lines in 1859. A large majority of men prefer the breech-loading arm, but there are those who still adhere tenaciously to the old-fashioned muzzle-loading rifle as preferable to any of the modern inventions. Among these may be mentioned the border hunters and mountaineers, who can not be persuaded to use any other than the Hawkins rifle . . .
Crafted by the brothers Hawken in St. Louis, the Hawken was based on the American longrifle, a slender, long, full-stocked, small-caliber gun used to good effect in the American Revolution and to put venison on the plank ever since. The idea was to create a shorter rifle with a half-stock, bored to 50-caliber or bigger. It would be barrel-heavy and weigh nine pounds or more. Instead of shiny brass, it would be fitted with browned, non-reflective hardware. One of the more famous of these was carried by Francis Parkman, Jr. who wrote of his adventures on the frontier in The Oregon Trail. Headed east, the party jumped a huge mule deer buck. Parkman called it a black-tailed deer. The country in front was wild and broken, half hill, half plain, partly open and partly covered with woods of pine and oak. Barriers of lofty mountains encompassed it; the woods were fresh and cool in the early morning; the peaks of the mountains were wreathed with mist, and sluggish vapors were entangled among the forests upon their sides. At length the black pinnacle of the tallest mountain was tipped with gold by the rising sun. About that time the Hail-Storm, who rode in front gave a low exclamation. Some large animal leaped up from among the bushes, and an elk, as I thought, his horns thrown back over his neck, darted past us across the open space, and bounded like a mad thing away among the adjoining pines. Raymond was soon out of his saddle, but before he could fire, the animal was full two hundred yards distant. The ball struck its mark, though much too low for mortal effect. The elk, however, wheeled in its flight, and ran at full speed among the trees, nearly at right angles to his former course. I fired and broke his shoulder; still he moved on, limping down into the neighboring woody hollow, whither the young Indian followed and killed him. When we reached the spot we discovered him to be no elk, but a black-tailed deer, an animal nearly twice the size of the common deer, and quite unknown to the East. We began to cut him up; the reports of the rifles had reached the ears of the Indians, and before our task was finished several of them came to the spot . . . we hung as much of the meat as we wanted behind our saddles, left the rest to the Indians, and resumed our journey. A lot of us still prefer a Hawken to a breechloader, at least some of the time. One reason is that a muzzleloader allows access to a number of high-quality limited-entry hunts. 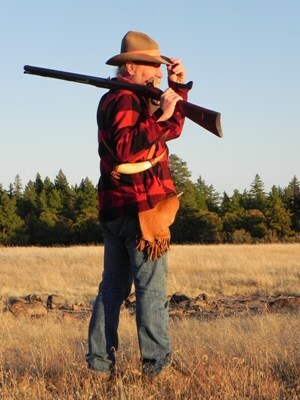 Out in the desert, Oregon's most sought-after Controlled 100 Series Deer Muzzleloader Firearms hunts are the Hart Mountain hunt, the NE Whitehorse and Juniper hunts. According to the statistics, it takes at least 10 preference points to have a decent chance to draw the Hart Mountain tag and 13 points to get in the game for a Juniper muzzleloader tag. For the hunter with a Hawken and less skin in the game, three other hunts offer more opportunity. Last year, a hunter with zero points, according to the 2011 Tag Guide numbers, had an 87 percent chance of drawing the 148M Ditch Creek tag. With two preference points, a hunter is almost guaranteed a spot in the North Malheur hunt. It takes three points to score a Silvies Unit hunt with near 100 percent certainty. The Silvies Unit represents a good opportunity to make your Hawken speak. Harvest success ran 43% in 2010 (the last year data was available). In the North Malheur hunt, 13% of hunters tied their tag on a buck. In the Heppner Ditch Creek area, muzzleloaders finished with 23% success. This year's deadline for the Controlled Hunt Lottery is May 15. The West is a different place than when Parkman carried his famous rifle, but the old trails still skirt the ridgelines. On a horse or afoot, if we head east into the sagebrush and junipers, we might yet jump bucks so big flatlanders could confuse them for elk.